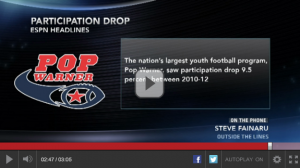 Pop Warner officials said they believe several factors played a role in the decline, including the trend of youngsters focusing on one sport. But the organization’s chief medical officer, Dr. Julian Bailes, cited concerns about head injuries as “the No. 1 cause.” Read more here.